More flexible than it seems at first look, Beatstation will appeal to those who want to create drum kits and grooves in a hurry. Great for building drum kits quickly. Basic, easy sampling functionality. Decent bundled library. REX file support and good effects. CPU-friendly. No multiple outputs. Fixed MIDI mapping. Minimal documentation. Does Beatstation end up appealing to no one in particular? In keeping with its open-ended nature, Beatstation offers numerous skins so you can customise its look. When Beatstation was announced, it wasn't clear what it was or who it was designed for. And even after spending some time with it, we're not sure we can answer either of these questions. Stranger still, we're not sure Toontrack could either. They call it "a tonal and percussive open surface new generation virtual instrument", which is accurate enough, but tellingly, the sell line for Beatstation is vague and non-committal: "It's what you want it to be." "Ultimately, it's hard to say exactly what you will find it useful for - if anything - until you actually give it a go." 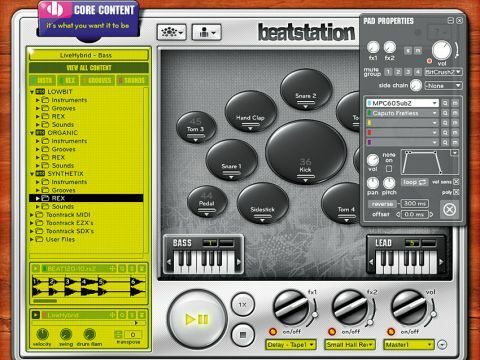 Beatstation has the look of a groovebox, with the main part of the interface taken up by a bank of sample-based pads. You can add and remove pads, drag them around and select from four pad styles: one square and three circular ones of different sizes. The pads are designed for rhythmic sounds but there are also Bass and Lead 'pads' (actually mini virtual keyboards) for instrument sounds. You can change the look by loading up skins, and you can design your own with the Skin Tool. The pads can be filled up with samples from the browser sitting to the left. Beatstation ships with content in Lowbit, Organic and Synthetix categories, and in each of these you get drum kits/instruments, MIDI grooves, REX files and individual sounds. You can load up sounds as a whole kit or on a pad-by-pad basis. The quality of the library is generally good, with the acoustic drums being particularly impressive. There's plenty for those who aren't so keen on 'real' sounds too, though, with dance music and hip-hop fans well catered for. Crucially, it's possible to bring your own samples and loops in. MP3 and WAV formats are supported, and MIDI and REX files can be imported. You can also use expansion packs in Toontrack's EZX and SDX drum kit formats, as well as the new Beatstation-specific BTX format. Below the browser are REX and MIDI file players, which can run independently or (in sync) together. To hear everything you've got loaded, just hit the play/pause button. To the right of this are two FX busses, a master effect and a master volume control. The effects come from Overloud, which ensures better than average quality, and the range is extensive, with categories including Bitcrush, Chorus, Compressor, Delay, Distortion, EQ and Reverb, as well as instrument-specific ones for piano, bass, snare, vocals, etc. Each effect has just a single slider to play with, enabling you to dial in 'more' or 'less' of that effect. And that, on a basic level, is it. If you want to use Beatstation very simply, run it standalone, load some sounds and/or a MIDI/REX file and click the pads or press play. There's not a lot you can do with your sounds, though, as parts can't be edited and there's no sequencer. Thankfully, Beatstation also works as a plug-in instrument, so you can use it to make songs in conjunction with a compatible sequencer/DAW program. You might be thinking that Beatstation is very much a beginners' tool, but if you look below the surface, it's surprisingly capable. Open a pad's Properties window and you'll find some fairly powerful sound design features - up to five samples can be layered on each pad simply by dragging and dropping, and each layer can be tweaked individually. The likes of volume, ADSR, pan and pitch can be adjusted, and there are reverse and offset options, making it quick and easy to build up layered sounds. There's no dedicated filtering or EQ, but you get one insert effect slot per pad, for which EQ/filters are an option. In standalone mode, you can record your samples via the built-in recorder. Although Beatstation doesn't have its own sequencer, when you're running it in standalone mode, it does boast a sound recorder and editor, and this proves to be very easy to use. Once you've opened the dedicated window, you simply select your audio input, hit the record button and make some noise. Once you've recorded your sounds, you can normalise the resulting audio file, crop it to remove any unwanted silence and adjust the fade handles. Drag the audio file onto a pad and it instantly becomes one of said pad's layers. It's also worth noting that if you do this with a melodic sound and you put it on either the Bass or Lead pad, you can tell Beatstation what note it is, so the software can pitch it across the keyboard. The patches you can generate in this way might not be up to velocity-layered, multisampled standard, but if you want an incredibly quick and easy way of creating playable sounds, you've got it. Handily, this also works with your own imported samples and REX slices, giving you more flexibility, though it would have been nice if the software could automatically detect pitch, as this would help beginners who might not necessarily know anything about musical notes. Then there's that REX file player. As well as being able to play back REX files, you can also drag a complete REX file onto a pad, or just a slice from it. So, if you just want to use one hit from a loop in your drum kit, it's easy to get at it. The MIDI file player offers velocity, swing, drum flam and transpose controls. You can drag and drop MIDI parts from Beatstation onto tracks in your DAW, or convert them to audio. Plug in a MIDI keyboard and you'll find that the lower register plays the bass instrument, the middle area fires off the pads and the upper octaves are dedicated to your lead sound. The downside is that the mapping is fixed so you can't, for example, plug in a drum pad controller and assign the pads as you want them. When you're using Beatstation as a plug-in in your DAW, there's just a single stereo output, which won't please those who want each sound popping up on a different DAW channel for easy mixing and application of plug-in effects. So, how to sum up Beatstation? The more you use it, the more potential uses spring to mind. There's plenty for anyone who wants a quick groove or an easy way of building a layered and processed custom drum kit. That said, beginners might be put off by the fact that it's not a self-contained production package, while pros will bemoan the lack of comprehensive controller support and multiple outputs. The documentation is also flimsy, consisting of a few annotated images pointing out what the interface does, plus some videos on the website. Ultimately, it's hard to say exactly what you will find it useful for - if anything - until you actually give it a go, and unfortunately there's no demo. For some users, it will feel like less than the sum of its parts, while others will find that it slots seamlessly into their workflow.